Now, I know bibs are not articles of clothing, but they cover and protect clothing, and so, they are my first things finished for the Kids Clothes Week Challenge. Because I committed to sew for one hour per day for seven days, I'm getting more sewing done after gardening. I spent a lot of time finding a bib for a newborn. Yes, I know I said I was going to cut down my time spent online, but there was no other way to find a pattern and I didn't have a small baby bib here that I could trace. I have reduced my usage of Facebook and Pinterest, and so I've actually gained some time... LOL!!! Most bibs I found were for older babies, or toddlers and a couple I found had necks that just appeared way too small. Eventually, I decided on a reversible bib pattern I found over at Randomness by Petchy. 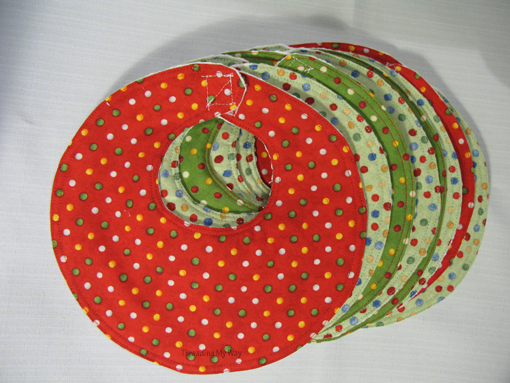 My bibs have been made with four different polka dot fabrics. For the reverse side, I used a pre-loved cotton baby blanket. I forgot to ask my daughter if she'd used it with her littlies, as it feel so soft and looks like new. The backing is thick and will be quite absorbent. In all my years of sewing, these are only the second set of bibs I've made. 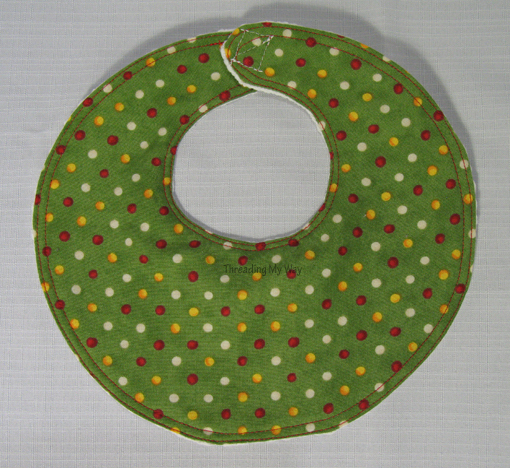 A cute feature of the first set was the backing fabric which showed on the front of the bib. It looked great, but was a little fiddly, so this time I've chosen an easy design. Trace the pattern and cut out. Sew back and front together leaving a gap. Turn to the right side. It doesn't get any easier than this!!! I've sewn two rows of topstitching around the bib, with the first one being as close as I could get to the edge. I really must buy a twin needle for non-stretch fabric. These little bibs are my small contribution for this month's sew-along with Kristy, over at Hopeful Threads, in support of Sew For Kids. I'll be adding my bibs to the Flickr group. If you are looking for sewing related ideas for babies, head on over to Kristy's Pinterest board. You'll find links to lots of free tutorials and patterns. I thought I'd whip up these eight bibs in one night, but not so. I think I spent too long looking for a patten and choosing fabric... LOL!!! Project number two is cut out and ready to sew tomorrow. You can see all of the projects made during the KCWC, over at the Flickr group. Really sweet bibs Pam. They look almost Christmassy to me with the reds and greens! 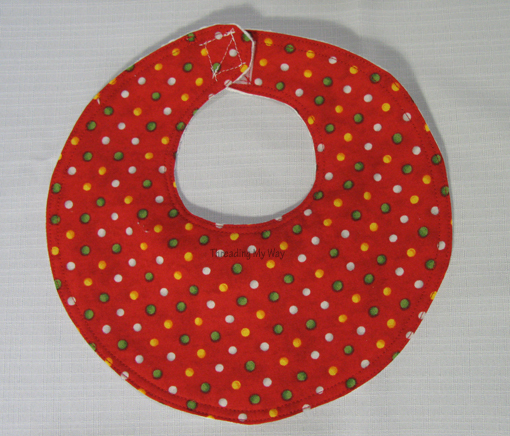 they are really cute bibs, I love the shape! Wow, these are seriously cute!!! 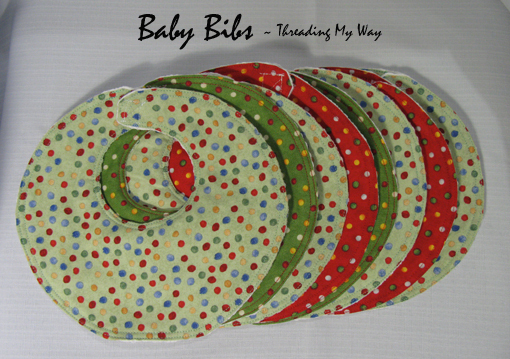 Haha Pam - great minds - I have just whipped up a batch of bibs using pretty much the same method! They look great, I love the polka dots! Great job on the bibs Pam! Pam, the bibs you did are so beautiful, I love the design and the colors. One more time, you did a beautiful job! Thanks for sharing! What sweet bibs! Thanks for sharing. Those are adorable! I love that they're reversible. Thanks for linking this up to The Fun In Functional! So cute!! You did an amazing job! super sweet, thanks so much for sharing on Craft schooling Sunday!